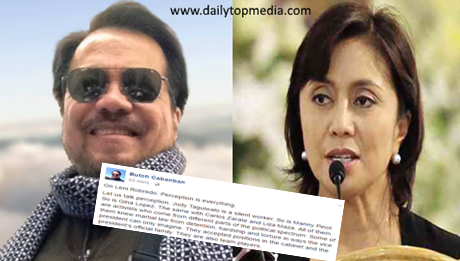 Home / Viral / Butch Cabanban: Vice President Robredo is not a silent worker. Butch Cabanban: Vice President Robredo is not a silent worker. On Leni Robredo. Perception is everything. Let us talk perception. Judy Taguiwalo is a silent worker. So is Manny Pinol. So is Gina Lopez. The same with Carlos Zarate and Liza Maza. All of them are activists who come from different parts of the political spectrum. Some of them knew martial law from detention, hardship and torture in ways the vice president can only imagine. They accepted positions in the cabinet and the president's official family. They are also team players. Vice President Robredo is not a silent worker. She was very visible in media. From interviews on radio and television, mostly on disagreements with the administration she serves. The mainstream media reported with regularity every political statement of the vice president. The same can be said of the opposition social media. Her disagreement on policy issues with the president and his administration. Her stand on the Marcos burial issue. Her stand on martial law. Her position on extra judicial killings. Her anti-administration statements. Petty issues on decorum of the president vis-a-vis the vice president. Not so long ago, her speeches with Filipinos in the US. So much political juice and propaganda was milked from every anti- administration statement made by the vice president, perceived or otherwise. Her handlers packaged her that way. In contrast, can we even recall interviews on programs of government, official statements or news on her accomplishments and performance as a member of the cabinet? It does not help that the vice president has graced the cover of glamour and society magazines in less than six months. That sticks to the mind. The public wants to know what has she accomplished? Other than posturing as a member of the opposition, what has she really done? Today, we are swamped with a barrage list of accomplishments from the ministerial to inconsequential reading like an evaluation report for promotion to the next higher position in a company. Ultimately, the president does not owe the vice president a cabinet position. Robredo's appointment to the cabinet was a political accommodation, goodwill gesture and a chance for her to learn. In the barest form, she was elected to serve as acting president in the event of death, resignation or incapacity of the president. That is her role and yes, she is a team player. With the opposition. Always helps for someone to hit the nail on the head. Kaya lang, this needs to be done more often para naman magpatuloy na ang edukasyon ng mga mamamayan. korek and agree she has not contributed anything but ride on thethe anti duterte drive by her lemon group!